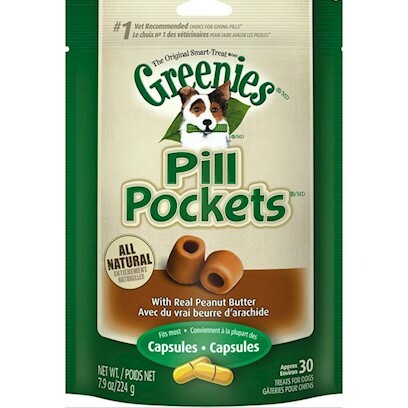 GREENIES® PILL POCKETS® Canine Treats are healthy and nutritious treats with a built-in pouch - ideal for hiding a tablet, capsule or liquid medication - so that most dogs don't even notice there's medicine inside. They're the #1 veterinarian-recommended choice for giving pills. Peanut Butter flavor your pet will love so much, they won't even realize they're taking their medication! Made with real chicken or beef, GREENIES® PILL POCKETS® Treats are a nutritious and healthier alternative to the commonly used human foods (cheese, peanut butter, tuna), as they contain fewer calories and less fat and sodium. They also contain antioxidant vitamin C and E to promote a healthy immune system. If you or your pet isn't 100% satisfied, you'll receive your money back. Guaranteed. GREENIES® PILL POCKETS® Treats mask the smell and taste of medicine to make sure your dog takes his medicine successfully, turning the experience more enjoyable for both you and your strong. Hold the PILL POCKETS® Treat with your thumb and forefinger. Insert the tablet or capsule, or pour in liquid medication. Using the same hand that held the PILL POCKETS® treat, squeeze the top half closed. The PILL POCKETS® Treat is now sealed, and you can feed to your dog.